Soluble Business Solutions partners Valery and Valery demonstrate how by devesting 'society' of its 'cultural veneer', the individual cream-filled 'small business' can, with the aid of bank loans, be catapulted into emergent markets. Note the airborne 'small business' in midflight. Regular performer and stage manager at the monthly absurdist cabaret night held at the Marlborough Theatre. Tickets available here, and the event facebook page is here. Images featured here are from the instructional business motivation seminar run by Vallery (Annie brooks) and Vallery (Ulysses Black), of Vallery & Vallery Soluble Business Solutions. The piece made use of a complex analogy about society, culture, 'the people', small business, bank loans with topical references included and outrageous language delivered by both Vallery and Vallery, through the medium of the profiterole firing squad. This performance appeared at the first Happy Clap Trap, with subsequent performances, sketches and absurd art continuing with similar gusto. A Clap trap Christams 2012 bore witness to a whole revised nativity in which the audience were treated to the revelations of the identities of the shepherds, the real motivations of Herod, the fraudulence of the Magi and the surprisingly baritone warblings of the baby Jesus. Unfortunately there is very little documentation of these monthly events. Photographs reproduced courtesy of Ashka 2012. Vallery & Vallery (Annie Brooks and Ulysses Black) deliver their closing remarks at the first Happy Clap Trap event. 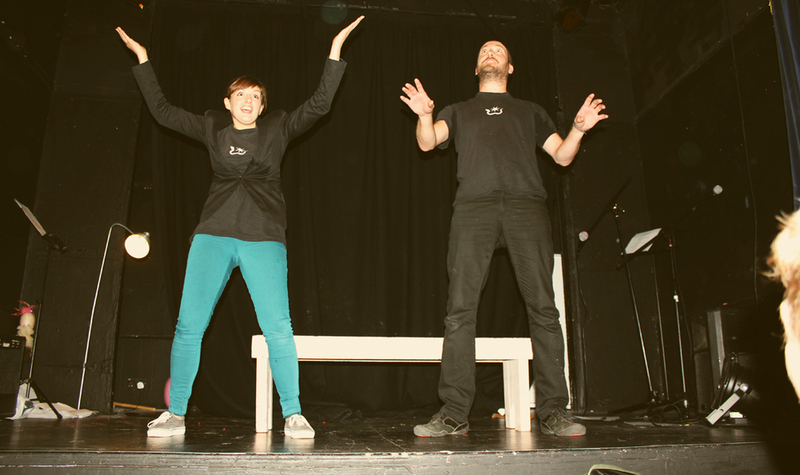 Closing moments of the Happy Clap Trap Xmas Nativity Special. Marlborough Theatre, Dec 2012.